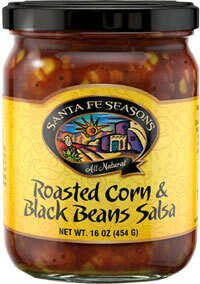 Sweet corn is roasted, beans are barbecued and the smoky chipotle chiles bring 'em all together. It eats like a meal and creates a tempting burrito. Use as a filling for enchiladas. Fresh red chile, red bell peppers, apple cider, tomatoes, onions, vinegar, red jalapenos, garlic, sea salt, and spices.